Visit Lloyds Auctions in Carrara or bid online for this auction. There’s one question to ask yourself when it comes to mechanics, trucks and marine equipment – what gets your engine revving? Well, you are sure to find it here at Lloyd’s Auctioneers. From tight-wad tinnies to the most luscious of Lamborghinis, it doesn’t matter what you are in the market for, we will auction it. We are a leading provider of car auctions Australia. We run the gamut from aircraft and farm equipment all the way to a wide selection of power tools. Our Australian auctions offer a diverse cross-section of automotive, trucks and marine goods. Maybe you are after a “fixer upper”. Or, maybe a Mercedes covered in diamonds is more your taste – and yes, they do exist! 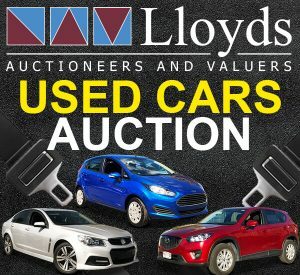 We have all makes and models of cars & bikes for sale on rotation here at Lloyd’s Auctions. From a Porsche Boxster convertible to a Holden Astra, you just might find your very next ‘car baby’ right here. Our auctions are the perfect way to score a sweet ride at a fraction of the regular price. The only question left is what to name him or her. May we suggest ‘Clifford the Big Red Car’? For those true car enthusiasts, we source a regular offering of classic cars for sale. The possibilities include Model T Fords and vintage Holden HQ panel vans. Are you big into bikes and adventure sports? We have you covered. Harley Davidson’s, quad bikes, even dune buggies – the list goes on! For the mechanics – or even just the tinkerers – you will find a wide selection of auto accessories available for auction. Whether it’s wheel rims, light fittings or wiring connectors we have you covered. Take a look at the wide range of automotive parts & accessories often available in our regular car auctions. If you want to keep ‘trucking’ then you have come to the right place. We have trucks for sale, you guessed it – by the truckload. Whether you are requiring a ute or you need to upgrade your fleet we have the solutions you are looking for at our Australian auctions. What floats your boat? Does a jet ski tickle your fancy? Or, you could imagine yourself right at home on a Yacht? But, who couldn’t, really? The thing is, if you have acquired yourself a marine vessel from Lloyd’s Auctions it’s likely to be for a steal. That makes treating yourself all that much sweeter. We have so many boats for sale. You might source a kayak, a sea cruiser, a houseboat or even a hydroplane. It doesn’t matter what you are into or what you need, check out our site and visit our premises during viewing times to score your next “dreamboat”.